Tannins are astringent, bitter-tasting plant polyphenols that bind and precipitate proteins. The word tannin refers to the source of tannins used in tanning animal hides into leather; however, the term is widely used to refer to brown color in water caused by decaying organic substances. Tannins in well water form from humic acid, which is one of the major components of humic substances, the dark brown, organic constituents of soil otherwise classified as Natural Organic Matter (NOM). Tannins are more common in surface water supplies (particularly marshy, low-lying, or coastal areas) and shallow wells than in deep wells. However, tannins can also be found in peat, coal, upland streams, and ocean water. Tannin is approved for use as a dispersing agent in pesticide formulations applied to growing crops only. Tannin has low acute, subchronic, and chronic oral toxicities in animal studies, and is nonmutagenic and noncarcinogenic. In developmental studies, no effects on nidation (implantation), maternal or fetal survival, or abnormalities in soft or skeletal tissues were seen at dosages of up to 135 mg/kg (mice) and 180 mg/kg (rats). In addition, a three generation rat reproduction study resulted in a NOAEL of 60 mg/kg bw/day and a LOAEL of 117 mg/kg bw/day (lower pup weaning weights), with no effects on fertility, gestation, viability, or lactation indices at any dose level. Reduced fecundity was observed in mice fed a continuous diet containing 8% both prior to and throughout the breeding cycle(s). The exposure of the general population to tannin from its use in pesticide products is expected to be small in comparison to exposure from its natural occurrence in feed grains, wine, tea, fruits, and forage, and its use as a direct food additive in numerous food and beverage products. Considering its rapid atmospheric oxidation, ready biodegradation, as well as its low toxicity and rapid metabolism and excretion, dietary exposures of concern from the use of pesticide products containing tannin are not anticipated. Residential exposures of concern are not expected from the use of tannin as an inert ingredient (dispersing agent) in pesticide formulations. Tannins, like turbidity, which we covered on Friday, are rather easy to detect due to their discoloring of water and distinct bitter taste. However, you should still test your water for tannins as well as hardness and the presence of iron and manganese before selecting a system for tannin removal. 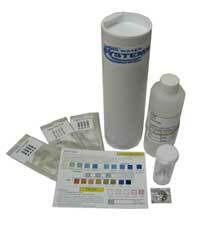 Any one of our well water test kits will include a test for tannins. A tannin filter is your best bet for removing tannins from your water, though you might consider installing a few additional systems for increased performance. Because common tannin treatment uses an organic scavenging anion exchange resin that is sensitive to hardness, water softeners are commonly included in tannin treatment systems. 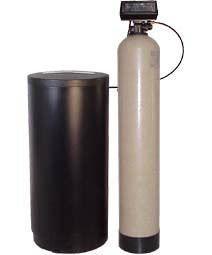 You might also include a chlorinator to kill bacteria and odors that may accompany tannins in your water, though your chlorinator should be paired with a contact tank to ensure proper mixing and contact time between the chlorine and your water, and should be followed by a carbon filter to remove any lingering chlorine tastes and odors after chlorination. If your tannin is accompanied by iron and manganese, you’ll want to install an iron filter or ozone injector to filter the iron and manganese particles after they have been oxidized with a chlorinator. A UF system will also filter tannins from your water, though such systems require proper pre-treatment like a sediment backwash filter or 5/1 micron cartridge filter to protect the UF membrane from large sediment and prolong its lifespan. Browse our test kits, tannin filters, chlorinators, carbon filters, and more in our online store, and consult our resources page for more how-to-guides and FAQS about water treatment topics.